A little bit of Fountain Pen History, and a little bit of mystery in this post. I stumbled upon this one page advertisement in an 1898 issue of McLure’s Magazine. 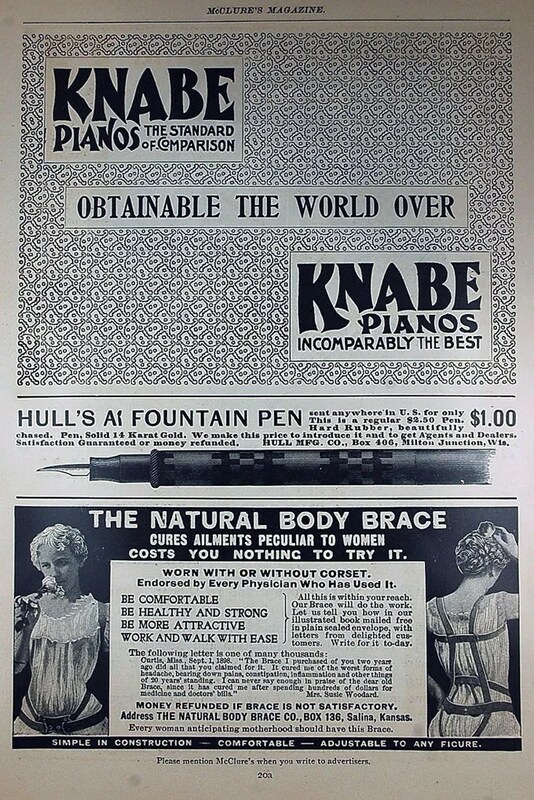 The middle advertisement is for the Hull’s A1 Fountain Pen. I am certainly not an expert in the area of pre-1900s pens, but this one grabbed me due to the name of the Pen and Manufacturing Company. If you go back to an old post of mine from April 3, 2008, titled Fifth Avenue Fountain Pens, you will see that much of the research that I did on these inexpensive pens made during the Great Depression, was based on a memoir of Philip Hull, a long time employee of Parker Pen in Janesville, Wisconsin. The fact that this pen carried the same name caused me to take a photo of the page from McLure’s, and try to find additional information on Hull Manufacturing and their pens. Milton Junction is just north of Janesville (where Parker Pens was established in 1888). Current research is spotty at best, but a few pen researchers have provided some information below, in green. Philip Hull was one of many Hull’s that worked for Parker over the years. Examination of his genealogy reveals mostly farmers in the Milton and Janesville areas. I did uncover one patent given to a Richard Hull of Milton Junction in 1894, but it was for a process to exterminate Canadian Thistles. Searching back through names in the Milton Junction area during the late 1800s and early 1900s shows that there were several Hull’s and I just have not found the right connection. “.…… Around 2007-8, L P wrote to me that he was particularly interested in the history of Parker ink, and according to him, Hull Mfg. Co. in Milton Junction was the company that, early on, was supplying Parker with their bottled inks, although the ink itself was probably made by Sanford, or Carter. And then George S. Parker apparently bought Hull around 1910. But your ad proves that they were also marketing, perhaps also manufacturing, their own fountain pens. Let’s give them the benefit of the doubt and say that they made their own pens. M K wrote on Zoss on Sept 23, 2007 that he found “an extremely fine specimen” of an eyedropper pen imprinted simply “Milton, WI”, but no company name, so it’s a mystery. Michael Fultz once told me that there were quite a few fountain pen companies in Janesville and area. These include Burdick, Corona, Deadlock, Green, Held, Hull, Klymax, Love, Perry, Safford, H. B. Smith, Valentine, and Williamson. Some of these were in Janesville, while others were in Milton, Wis., or Milton Junction, Wis., and Zion, Ill., and some later moved to Chicago. He also mentioned Ryter, but he may have meant Ruyter in Chicago. “I recall in my research a note from c1910 that Geo S Parker purchased the ink manufacturing or ink filling business from Hull Mfg. In 1910 Parker business was growing quickly and he was searching for a larger manufacturing facility in Wisconsin. He had offers from other cities to relocate but eventually chose the Main St building later known as Beverly Theatre. Geo S. Parker stated “the ink formula had not been changed in 70 years.” I have continuing research on Parker ink manufacture and I believe it was at this time Parker started to bottle either Sanford or Carter ink under his own label. Examples of Parker ink from this period are extremely rare, I have seen only one example intact with labels in the last 30 years. Clearly there was a lot of pen activity in the Southern part of Wisconsin during this period and is interesting how many of these smaller companies were active, and if the ink business with Parker is accurate, then Hull was active in some form until at least 1910. I have heard of and seen the Williamson and Corona Pens, as well as Century (Whitewater, WI) Pens. Klymax clips can still be found and I have written about the Safford Pen Company Fifth Avenue in a previous post, which used much of Philip Hull’s information. The other Companies mentioned are a mystery to me, and I hope that further inquiry will lead to a few more answers. For instance, was Hull Pen actually a manufacturer, or did they simply sell pens made by someone else under their name? Was Hull Pen related in any way to Parker Pen? Who was behind Hull Pen? How much longer did they last after these 1898 advertisements in McLures? As always, if you have any additional information, I would enjoy hearing from you and will share here.